First off, I have to say WHAT A COVER! I am totally drawn to covers and this one grabbed my eye immediately. I would have grabbed this beauty off the shelf and raced to the counter to pay – without even reading the blurb- all based on THAT cover! — just had to get that out there…. Set in Jaxton, USA – the reader comes face to face with fear, paranoia, obsession, loss, guilt, manipulation, abuse, damaged childhoods, shame, retribution, the need to be noticed – albeit for the WRONG reasons and the search for justice/the truth. Needless to say – it is one hell of an emotive journey! I had high expectations for this book after absolutely LOVING Follow You but I need not have worried as I was hooked from the start – Mr Parker is a true master of suspense! This was one intense and utterly chilling read where technology is used very cleverly in this storyline – I WANT THAT *** No Spoilers***- you’ll see what I mean when you read this book! I absolutely loved the way this story was set out and it had me guessing the motivation right until the very end. Mr Parker is one TWISTED author — but bloody hell – I totally LOVE that!! Character-wise – this book was full of mad, superb and utterly fascinating creatures of the human kind! Lana, Todd and wee Cooper were the main focus and really got under my skin. I could feel their fear. See their paranoia and almost taste their angst as each page turned. Life was never the same for this family once the baddie (*shudders*) came into their lives. Poor Lana was determined if not slightly obsessed at finding this vile creature who dared to take away her normal family life. Over protective but also quite vulnerable, I really admired her fierce loyalty to ensuring her family’s safety. Todd was so sure that Lana was over reacting, he was not prepared when tragedy struck again. However, he fought hard alongside his wife in the hopes that he could be the hero. The baddie – OMG OMG OMG – great bloody name for a sinister, creepy abductor of children – I won’t tell you the name as it is all part of the build up to the story but talk about #namesthatmakemyskincrawl. I loved the story behind this – and the many twists that followed. Who is he? Is he back again? What the hell is going on and why? Like I said earlier – total master of suspense, Mr Parker. I want to say so much more, but I fear that would spoil the story – so I won’t! So, the big question is….did I enjoy this book? Would I recommend it to others? Erm…HELLOOOOOO….this gets a total HELL YEAH recommendation from me — with bells on! If you are looking for a sinister, creepy, edge-of-your-seat read with a twisted, clever and cunning plot…look no further…just click the book below! 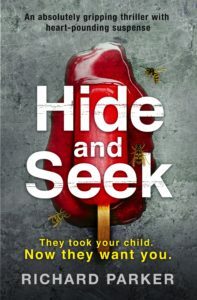 This entry was posted in Book Reviews and tagged #Crime #Twists #Murder, #CrimeFiction, #CrimeThriller, #Emotive, #Murder, #SerialKiller, #Suspense, #Thriller, Bookouture by crimebookjunkie. Bookmark the permalink. I enjoyed the gore in the first, but I know it is not everyone’s cup of tea. This one is very much different from that – so I do hope you grab a copy and enjoy! This sounds really good. I struggled with the author’s first book. It was a bit too gory for me so I ended up not getting this book. However, now I wish I did. The characterization(even the villain) all sound intriguing. I like the creepiness that you mentioned too. And yes, the cover is absolutely gorgeous. Fab review!